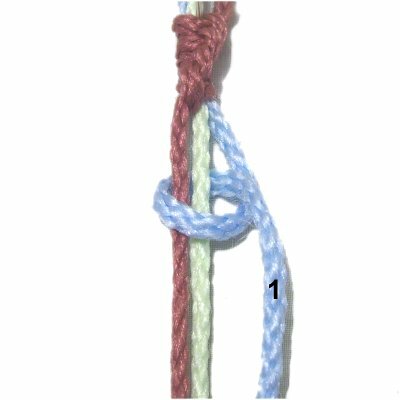 Description: The Half Hitch Spiral is used often in Macrame patterns, and is a popular decorative knot for Micro-Macrame jewelry. You can use it any time you need an interesting sennit, particularly a long one. So this design is suitable for items like plant hangers and hanging tables. 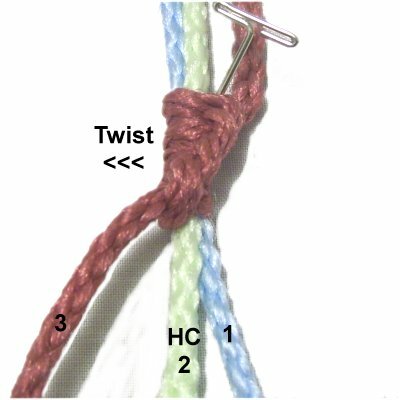 The Scallop Spiral and the Picot Spiral are also described on this page. 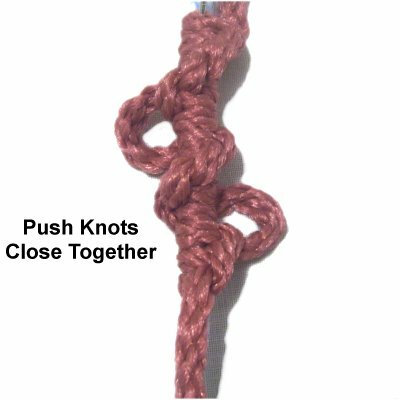 Both are vintage knots, popular in the late 1800's. Step 1: Secure two cords vertically on your board, to practice the Half Hitch Spiral. The working cord (wine) should be longer than the holding cord (blue), and should be placed on the right. 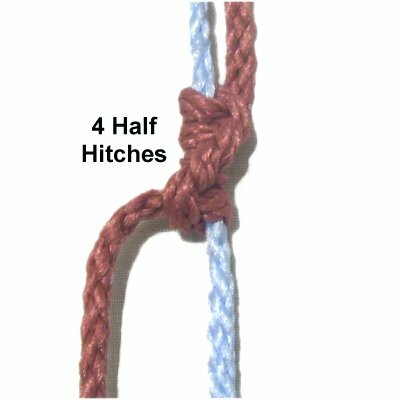 Tie a Half Hitch with the working cord, by making a clockwise loop over -under the holding cord. As you pull the end right, pass it over the working cord. Step 2: Tie three more Half Hitches (total of 4). 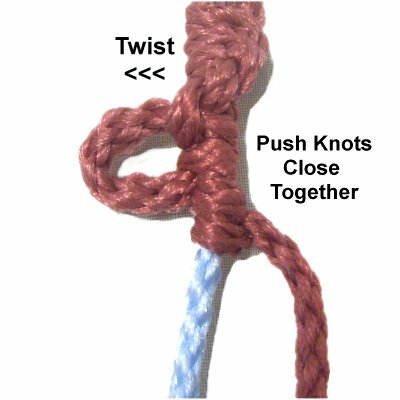 Push the knots close together, and allow them to spiral to the left. Step 3: Rotate the working cord to the right, passing under the holding cord. 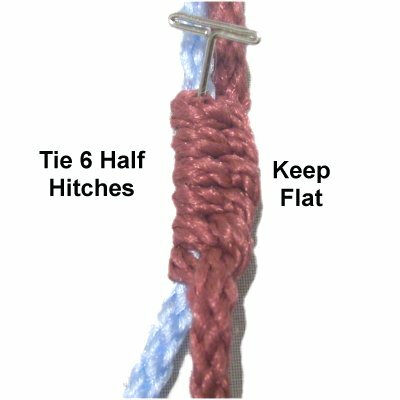 Continue by tying 5 more clockwise Half Hitches. Step 4: Repeat step 3 several more times to complete the Half Hitch Spiral. This unique vintage technique adds an interesting touch to the standard spiral design. 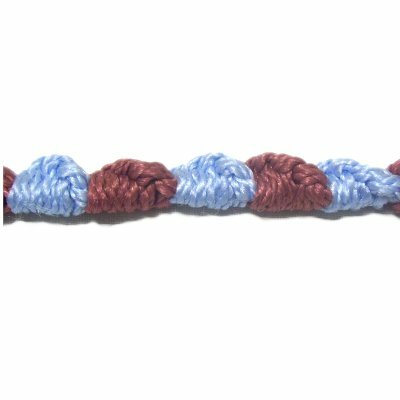 You add space between knots to create small picot loops. You can arrange the picots any way you wish. In the example shown, I alternated back and forth between the two sides of the sennit. Step 1: Secure two cords to your board vertically. Place the working cord to the right of the holding cord. 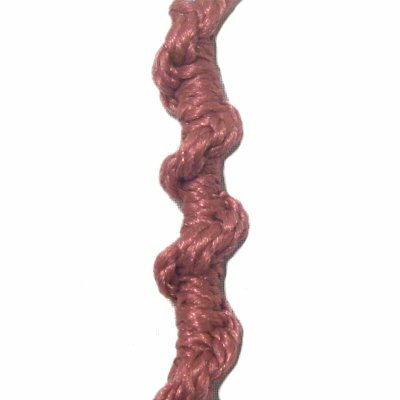 The working cord should be at least 36 inches long. Tie 6 clockwise Half Hitches with the working cord, onto the holding cord. Keep the knots as flat as possible. Step 2: Leave a 1-inch space, then tie 3 more Half Hitches. 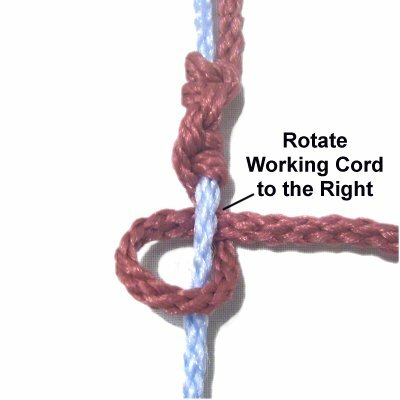 Designer's Tip: You can tie an Overhand knot to make a picot. You still need to leave a little space before tying it, so it stands out. 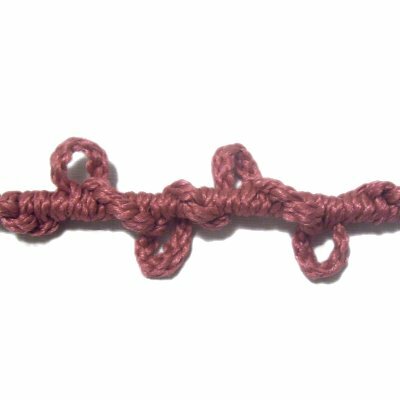 This is done often in vintage designs, to give the Half Hitch Spiral some detail. Step 3: Twist the first 6 Half Hitches to the left, to form the spiral design. 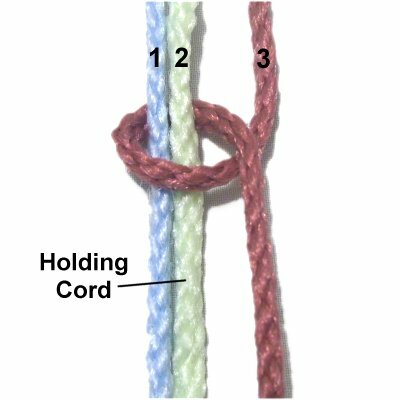 Push the knots close together to form the picot, which will rest on the left. The working cord should be on the right when you are through. Step 4: Tie the next 3 Half Hitches, allowing them to spiral towards the left. 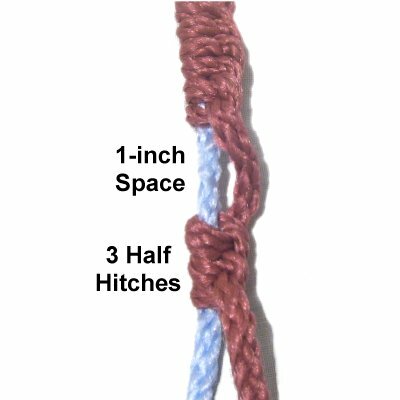 Designer's Tip: By tying only a few knots at a time, you will have better control over the shape of the Half Hitch Spiral. Step 5: Rotate the working cord to the right, passing it under the holding cord. Tie the next three Half Hitches, after leaving a 1-inch space. Step 6: Push the knots close together to form the picot, which will rest on the right side of the sennit. Tie the next 3 Half Hitches to continue. Step 7: Repeat steps 5 and 6 at least 1 more time, to make another picot loop. 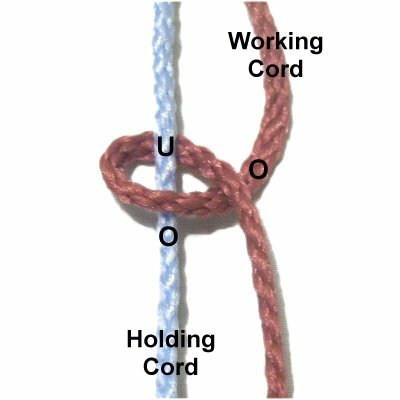 This unusual Half Hitch Spiral technique was found in a book written in the late 1800's. It's sometimes referred to as the "Shell Spiral". 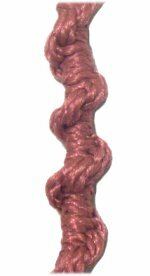 It forms a beautiful scalloped chain of knots that are suitable for purse handles, bracelets, and more. The concept behind the Scallop Spiral is that the pattern is interrupted due to the fact that you switch working cords. By working with the material, you can eliminate the twisting so the knots are curved to look like shells. Step 1: You'll need 2 working cords (different colors), at least 36 inches long. You also need one holding cord. Place the holding cord between the two working cords. Mentally number the cords. 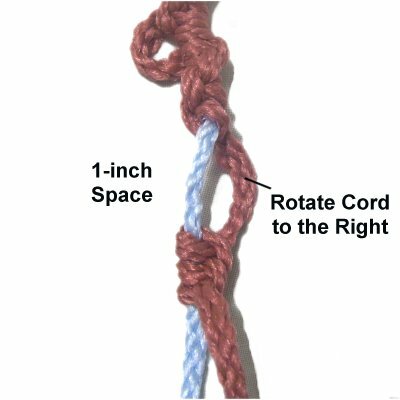 Step 1: Use working cord 3 to tie five clockwise Half Hitches onto cords 1 and 2. Step 2: Twist the Half Hitches so working cord 3 is on the left. Working cord 1 should be on the right. Step 3: Use working cord 1 to tie five clockwise Half Hitches onto cords 2 and 3. Step 4: Twist the knots, so working cord 3 is on the right again. Now it's ready for the next scallop. 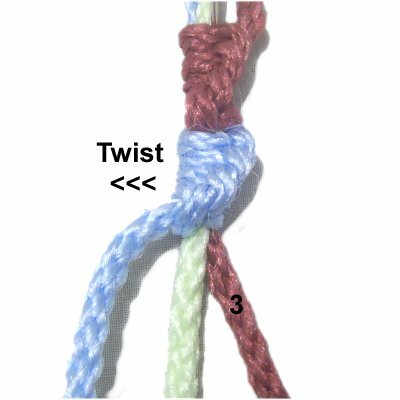 Step 5: Repeat steps 1 - 4 to continue making this variation of the Half Hitch Spiral. 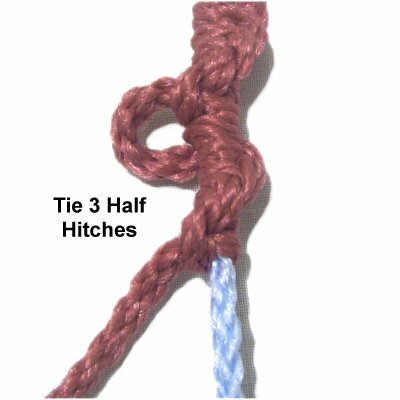 Have any comments about the Half Hitch Spiral? Contact Me.